There’s no other experience like it! Travellers from all over the world visit China to soak up its unparalleled cultural attractions, although many are surprised to discover how modern it has become. Of course, the ancient with all its traditions and splendour is still there in abundance, but nowadays it sits alongside the new creating startling, and often surreal, contrasts right across the country. China is far from being a holiday destination - it is a traveller’s paradise and one of life’s truly great adventures. Beijing may well be the starting point for many. Formerly known as Peking, Beijing has been China’s capital for 3,000 years. The Forbidden City, Summer Palace and the Temple of Heaven are popular sights, as well as the infamous Tiananmen Square, the antique stores of Liulichang Street, Silk Street, the Friendship Stores and Chairman Mao’s Mausoleum. Easily accessible from Beijing, a journey to the legendary Great Wall, which meanders over 3,000 miles across the China landscape is a never to be forgotten experience and should be combined with a visit to the Ming Tombs. A highlight of any visit to China is the underground army of 7,000 terracotta warriors found in the tomb of the first Chinese emperor on the outskirts of Xi’an. The tomb took 36 years to build and the section in which the warriors are found is only a small part of the whole. It is an incredible sight! Cosmopolitan Shanghai is famous for its fine arts, entertainment and crafts as well as being an important commercial centre. Make sure you visit the Garden of Joy (Yu Yuan), Jade Buddha Temple and take a stroll along the “Bund” road which runs along the busy Huangpu River. An evening out would not be complete without calling in at the famous Peace Hotel to listen to the jazz band. At Chengdu, tour the Chengdu Panda Breeding and Research Centre, whose aim is the survival and rehabilitation of these endearing creatures. Known as the Venice of the East, the charming town of Suzhou is home to intimate gardens tucked away down winding alleys and 24 canals. The Yangtze River (Chang Jiang), said to be the cradle of Chinese civilisation, is Asia’s longest river and the third longest in the world flowing for some 4,000 miles. The Three Gorges, Qutang, Wu and Xiling are the most famous attractions along the river and some of the most dramatic gorges in the world. Hangzhou is a core city of the Yangtze River Delta, which has been one of the most renowned and prosperous cities of China, due in part to its beautiful scenery, particularly West Lake. At Guilin take a boat trip along the Li River which winds like a green, silk belt through a landscape of limestone hills that rise dramatically from the river bank. Drink in the peace and tranquillity as you float by cormorant fishermen aboard bamboo rafts. The small laid-back rural town of Yangshuo lies in the north east of Guangxi Province. Take a hike up Moon Hill for breathtaking views of the dramatic scenery or stroll along West Street, which has become a window of eastern and western culture. The old town of Lijiang, a UNESCO World Heritage Site, is famous for its orderly system of waterways and bridges. It differs from other ancient Chinese cities in architecture, history and the culture of its traditional residents. Chinese cuisine is renowned worldwide. There are eight major culinary styles: Anhui, Fujian, Guangdong (Cantonese), Hunan, Jiangsu, Shandong, Sichuan and Zhejiang. Most westerners would be most familiar with Cantonese, which includes dim sum. In Beijing, Shanghai and many other large cities there are lots of shopping opportunities, with massive department stores and markets. Our vastly experienced travel advisors are passionate about China. With first-hand knowledge of when and where to go they can create the perfect holiday experience for you, at the best possible price. 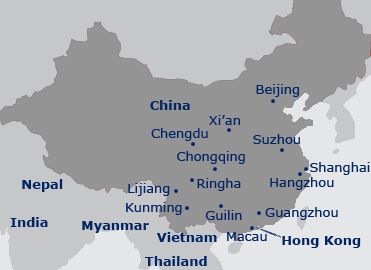 Flight duration: Beijing is approximately 10 hours and Shanghai approximately 12 hours (non-stop flights) from the UK. Additional airlines also fly indirectly from the UK to China::- Cathay Pacific (via Hong Kong), China Airlines (via Taipei), Emirates (via Dubai), Etihad Airways (via Abu Dhabi), KLM (via Amsterdam), Qatar Airways (via Doha), Thai Airways (via Bangkok & Vietnam Airlines (via Hanoi or Ho Chi Minh City). Currency: Renminbi, although you can only purchase limited local currency outside China. Whilst credit cards are widely accepted in the cities, especially in hotels, they may be less so in off the beaten track locations. Cash is a requirement if you are bargaining in markets! Language: Mandarin Chinese is the official language. In the south Cantonese is more widely spoken along with a number of local dialects. Best time to travel: The climate is wide ranging as you may expect from such a vast country. Normally the most comfortable seasons of the year are spring and autumn. Summer (June to end of August) can be extremely hot and winter can be incredibly cold, especially in the north.